Did an Amun Priest Kill King Tut? Background information about the possible murder of Tutankhamun and a prime suspect - Amun Priest. In 1968 and 1978 x-ray examinations of the mummy of Tutankhamun revealed that the mummy of King Tut had a mysterious dense spot on the lower back of the skull. 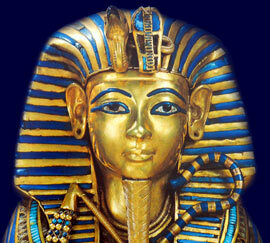 This lead to speculation that the young King Tut had been killed, or murdered, by a blow on his head. But did Did an Amun Priest Kill King Tut?? An Amun Priest has been put forward as a prime suspect in the possible murder of King Tut. But why would a priest of the god Amun want to murder the young Pharaoh Tutankhamun? Did an Amun High Priest Kill King Tut? - Did an Amun High Priest have the Opportunity? Our Western view of a priest is of a man dedicated to a religious life of prayer and ceremony. However in Ancient Egypt the role of a priest was very different. A pharaoh was seen as a living god. The priests were therefore tasked with both worshipping and advising the pharaoh, a living deity. A High Priest of Amun would have therefore been a powerful figure and served as a close political advisor to the pharaoh. An Amun High Priest would have had the opportunity of close contact with Tutankhamun and therefore the opportunity to commit murder. Did an Amun High Priest Kill King Tut? - Did an Amun High Priest have a Motive? Why would a High Priest of Amun want to kill King Tut?